WiFi routers are not great looking devices, but ASUS wants to change that with its newly announced Blue Cave WiFi router at Computex 2017. Although WiFi has become an integral part of our lives, but the devices that provide us with connectivity aren’t that pretty at all. We neatly tuck them away or surround them with other decorative pieces in order to make them look slightly better, relatively. But ASUS thinks we should place our routers out in the open, and that’s a treatment the company’s new Blue Cave WiFi router deserves. 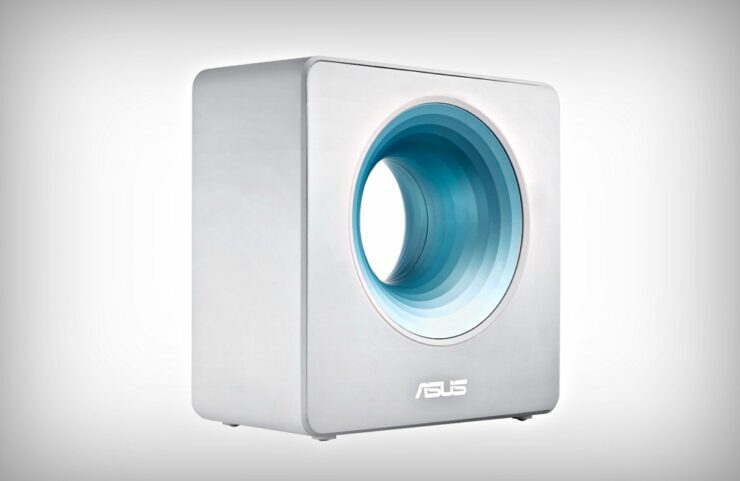 Rather than being a normal, run-of-the-mill design, ASUS took a unique approach with the Blue Cave. It has no visible external antennas at all, and of course, features a huge whole right in the center, giving it a look that is not meant to be hidden away behind a bookshelf or TV. Apart from the obvious (dare I say) good looks, the ASUS Blue Cave is an AC2600 dual-band router. This means you will be easily be able to stream 4K content while also transferring large files along with some online gaming. ASUS also claims that the Blue Cave supports more client devices than anything else that is available in the market. That’s a bold claim which smart home enthusiasts should definitely consider. Turning things around, the Blue Cave features four Ethernet ports, along with a WAN port and a USB 3.0 port. On the security front, the router features AiProtection, which happens to be powered by Trend Micro Smart Home Network. This ensures that you and your family stays safe online. But that’s not all, you can access the Blue Cave right from your mobile device remotely, with a new Family Overview feature baked in as well. This allows you to check out your family’s Internet and app usage and take control wherever necessary. Last but not the least, IFTTT and Alexa support is built into the router, allowing you to create smart automated tasks. Right now, it’s unclear when the router will actually go on sale. On the pricing front, users should expect to shell out $180, which is not bad if you’re asking us. But given how quickly mesh WiFi systems are taking over the tech space, it remains to be seen if ASUS can capture the market with its entirely new take on a WiFi router design.